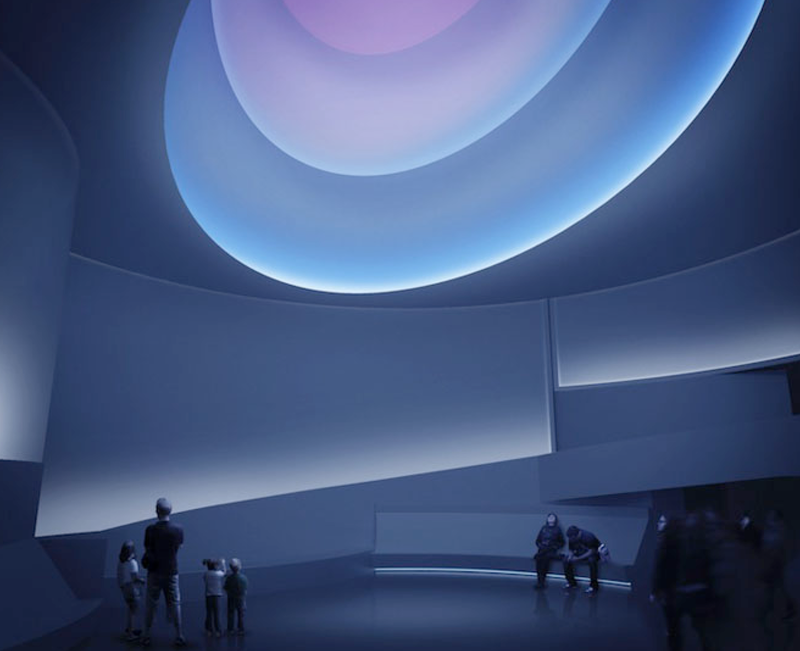 The Guggenheim has been taken over by the mind-bending explorations with light of James Turrell. Both the NYTimes’ Roberta Smith and that picky eater over at the New Yorker, Peter Schjeldahl, seem to have flipped their wigs over it, in particular “Aten Reign” which takes over the spiral and bathes it in a 60-minute light show. 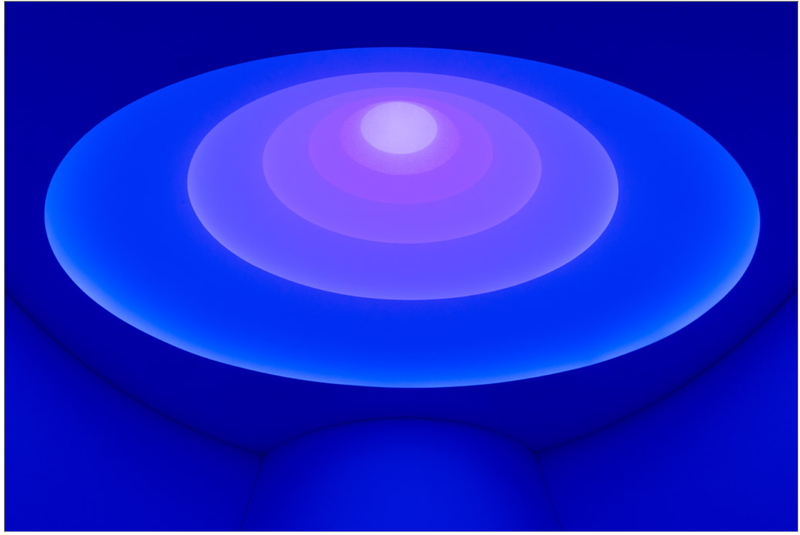 James Turrell’s exhibition at the Guggenheim Museum will probably be the bliss-out environmental art hit of the summer. This is primarily because of the ravishing “Aten Reign,” an immense, elliptical, nearly hallucinatory play of light and color that makes brilliant use of the museum’s famed rotunda and ocular skylight. The latest site-specific effort from Mr. Turrell, “Aten Reign” is close to oxymoronic: a meditative spectacle. Imagine this summer’s show at the Guggenheim Museum as air-conditioning for the eye and, if you’re gamely susceptible, the soul. Definitely seems like something to see. Years ago, I caught an Ellsworth Kelly show at the Guggenheim in which the ramp was aglow with reflections from the wonderful primary colors in his paintings. But Turrell takes that idea to a new dimension. 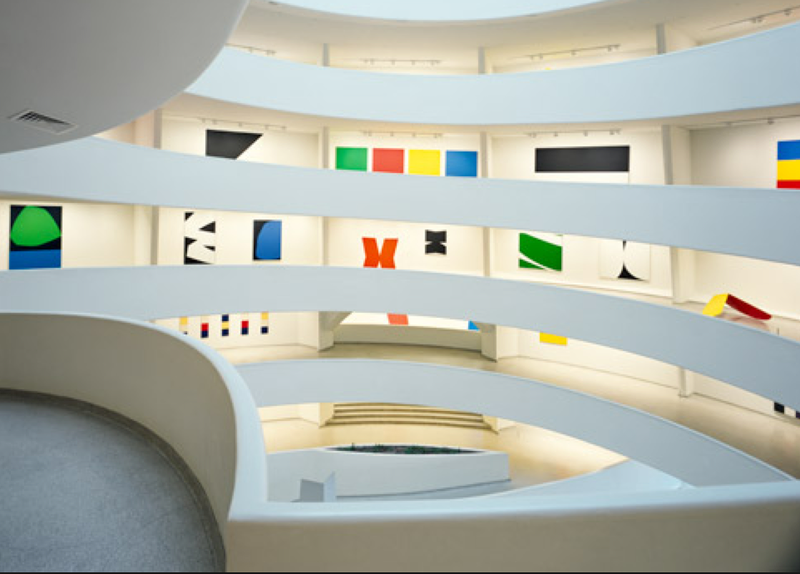 Ellsworth Kelly at the Guggenheim. If Taiye Selasi’s debut novel was as fascinating as its acknowledgments pages the book would be a triumph. Acknowledgments in books have gone the way of Oscar acceptance speeches in recent years, with ever more exhaustive tributes – though in the case of a book no prize has yet been awarded. Selasi’s list contains more than 150 names, and begins: ‘I am so very grateful to God, and (in alphabetical order, from the bottom of my heart) Andrew Wylie …’ It’s an unusual version of alphabetical order that gives Andrew ‘the Jackal’ Wylie pride of place and the proper proximity to God. (If Wylie was actually a god he would be Anubis, near the top of the list without any fancy footwork.) In fact the tributes here are arranged by alphabetical order of first name or, more eccentrically, title. There’s a run of family accolades: ‘Dr Juliette Tuakli my beloved mum, Dr Lade Wosornu my brilliant father, Dr Wilburn Williams my dearest dad’. Three parents, and all of them doctors. If there isn’t a novel in that then there’s no justice – but it isn’t this one. The rest is behind the pay wall, but you can read John Lanchester on Spanish banks or Michael Wood on “Behind the Candelabra” for free. American mezzo (I’d call her a contralto with high notes) Jamie Barton has won the Cardiff Singer of the World Award. This is the premiere classical vocal competition, a platform that has helped launch singers such as Terfel, Mattila, and Hvorostovsky. And here she is in last year’s Tucker gala (where the standard of singing was astoundingly high) doing the show piece from La Favorite. Perhaps a few things to work out technically at the top of the voice, but great poise, breath control for ages, and a Marilyn Horne-like power and commitment. And she is alive and singing like this right now. Every so often, it’s worth wondering what it might be like to encounter a golden age of opera in its early days, rather than bemoaning that “they just don’t make ’em like the used to.” She’s got a ways to go, perhaps, but is, like Pretty Yende, a “true type” opera singer in the great tradition. In this “The Rite of Spring” 100th anniversary year, much has been made of this epoch making work. And rightly so, as craggy monuments of genius go, it’s still got its rough edges and brilliance are intact–“news that stays new.” Fortunately, without the riots. The Rake’s Progress is much later, but also has the astringent, precise quality of Stravinsky in neoclassical mode–particularly the spot on string writing and the stunning, angular but expressive vocal lines. Since I loved these works, I naturally encouraged the singers I met one summer working at Central City Opera to listen to them and consider learning arias from them. “Such good audition pieces,” I gushed. Nuts. They are staggeringly difficult to bring off, and in the unlikely event you have the musical chops to master them, many a pianist is going to break out in a cold sweat when you ask them to open up the score. Sight reading a Stravinsky aria at tempo, with rhythmic accuracy, and when a job is on the line… Better stick to Quando me’n vo’. Here are two singers who have no trouble with the Stravinsky, though. First Dawn Upshaw, doing Anne Truelove from The Rake’s Progress. This role was a calling card for this great American soprano. She recorded it on an early album, and later performed the role all over. Here she is singing about Tom Rakewell in Stravinsky’s take on a very old-fashioned operatic form, the scene and aria: four parts, recit, aria, tempo di mezzo, and cabaletta (with repeat). New wine in an old bottle. From Oedipus Rex (full work on YouTube), Creon’s aria (sung by a young Bryn Terfel in a production by Julie Taymor). Creon is bringing news from the oracle: there’s a murderer in their midst. The original has a narrator who explains the action. Taymor, influenced by Noh theater, among other traditions, has a Japanese performer doing this job. As colleges begin using massive open online courses (MOOC) to reduce faculty costs, a Johns Hopkins University professor has announced plans for MOOA (massive open online administrations). Dr. Benjamin Ginsberg, author of The Fall of the Faculty, says that many colleges and universities face the same administrative issues every day. By having one experienced group of administrators make decisions for hundreds of campuses simultaneously, MOOA would help address these problems expeditiously and economically. Since MOOA would allow colleges to dispense with most of their own administrators, it would generate substantial cost savings in higher education. Could MOOA’s do any better at the all important task of gratifying universities’ edifice complexes. From PhD comics, and he’s way too easy on Gothic Envyist, a baleful architectural trend still with us. Cisco has a helpful diagram on how to configure an NSA-friendly network. Piece of cake, huh? Those squiggly lines between subscriber and law enforcement? Could that be the 4th Amendment? I continue to be fascinated by the way the NSA story is unfolding (back to poems and opera arias soon, I promise). How many thousands have access to these storage bins? Who decides to open any individual file and who then gains access to its content? Is there ever a chance to challenge the necessity of opening a file? And what happens to gleaned information that has no bearing whatsoever on terrorism? Going on to invoke J. Edgar Hoover, Joe McCarthy, Presidents Johnson and Nixon, Frankel points out that they are just a few, of a long dishonor role, that made political and personal use of secrets collected for other purposes. That high level officials, or regular bureaucrats might misuse citizens’ data for such baleful personal or political reasons, or might just ineptly lose track of it seems a real risk. 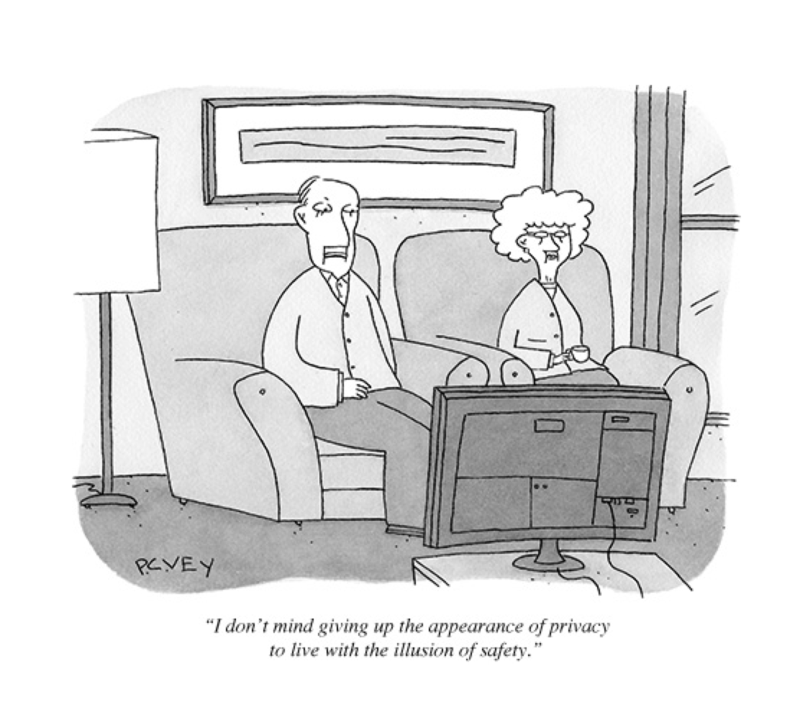 Private industry doesn’t have a great job of keeping people’s data secure (even companies who do this for a living). Would government really do a better job at it? Why should we think so? What ought to compound our skepticism is the news that there is money to be made in the mass approach. We are learning that much of the snooping is farmed out to profit-seeking corporations that have great appetites for government contracts, secured through executives who enrich themselves by shuttling between agency jobs and the contractors’ board rooms. We have privatized what should be a most solemn government activity, guaranteeing bloat and also the inevitable and ironic employ of rebellious hackers like Mr. Snowden. In the fiscal year ended in March 2013, Booz Allen Hamilton reported $5.76 billion in revenue, 99 percent of which came from government contracts, and $219 million in net income. Almost a quarter of its revenue—$1.3 billion—was from major U.S. intelligence agencies. Along with competitors such as Science Applications International Corp. (SAIC), CACI, and BAE Systems (BAESY), the McLean (Va.)-based firm is a prime beneficiary of an explosion in government spending on intelligence contractors over the past decade. About 70 percent of the 2013 U.S. intelligence budget is contracted out, according to a Bloomberg Industries analysis; the Office of the Director of National Intelligence (ODNI) says almost a fifth of intelligence personnel work in the private sector. Booz Allen and its competitors are able to keep landing contracts and keep growing, critics charge, not because their expertise is irreplaceable but because their Rolodexes are. Name a retired senior official from the NSA or the CIA or the various military intelligence branches, and there’s a good chance he works for a contractor—most likely Booz Allen. Name a senior intelligence official serving in the government, and there’s a good chance he used to work for Booz Allen. (ODNI’s Sanders, who made the case for contractors, is now a vice president at the firm, which declined to make him available for an interview.) McConnell and others at Booz Allen are quick to point out that the contracting process has safeguards and oversight built in and that it has matured since the frenzied years just after Sept. 11. At the same time, the firm’s tendency to scoop up—and lavishly pay—high-ranking intelligence officers once they retire suggests the value it places on their address books and in having their successors inside government consider Booz Allen as part of their own retirement plans. Not a supportable position, as Pro Publica makes clear. Finally, a neat summary what it all means to the couple on the couch, courtesy of a NYorker cartoon. Have heard promising things about BitTorrent Live, a streaming service that makes anybody a broadcaster. The old canard, “freedom of the press belongs to those who own one” is now perhaps updated for the 21st century. “FCC license? I don’t need no stinkin’ FCC license.” But will it really work? Quaint, but probably no wireless. 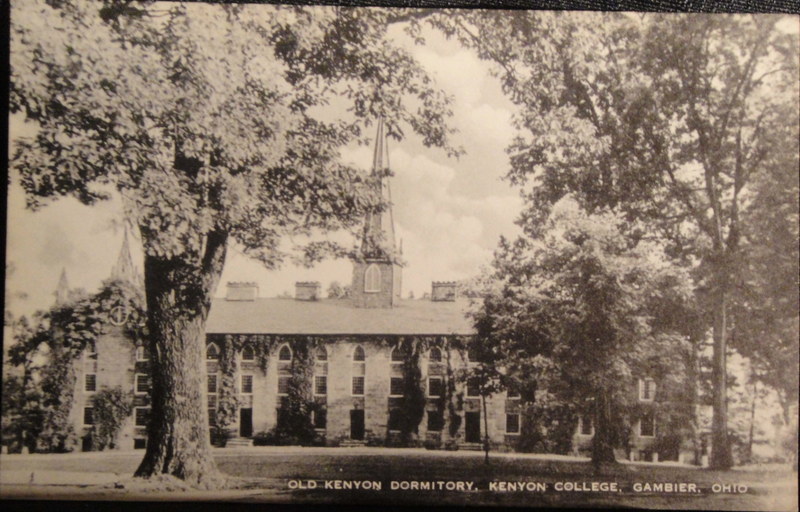 Kenyon College as it once was. Over the past decade, I have taught only online. Students in my classes are far-flung — two from Alaska this term among the others from the lower 48. In the past, I have had students from assorted countries; they bring a diversity, a richness of perspectives to classes that I never experienced previously. I taught eduMOOC in the summer of 2011; we had students in 70 countries. Engagement and interaction came through “meet-ups,” such as the group in Christchurch New Zealand who met weekly at the McDonalds (free wi-fi, don’t you know) to engage and discuss the future of learning. Brazilians tolerated our English language panel discussions and then met in their Portuguese language wikis. Still others engaged in Google Hangouts. The social constructivist principles of what scholars of education call the “community of inquiry” thrive online through teaching presence, social presence, and cognitive presence. Those are the very same principles that led to the success of the liberal arts college experience decades ago. Other views as well, though. Ian Bogost is not so sanguine. MOOCs are a kind of entertainment media. We are living in an age of para-educationalism: TED Talks, “big idea” books, and the professional lecture circuit have reconfigured the place of ideas (of a certain kind) in the media mainstream. Flattery, attention, the appeal of celebrity, the aspiration to become a member of a certain community, and other triumphs of personality have become the currency of thinking, even as anti-intellectualism remains ascendant. MOOCs buttress this situation, one in which the professor is meant to become an entertainer more than an educator or a researcher. The fact that MOOC proponents have even toyed with the idea of hiring actors to present video lectures only underscores the degree to which MOOCs aspire to reinvent education as entertainment. The whole roundtable is worth reading, if you’ve been following this world. Philosopher John Dewey (he of “education is not preparation for life; education is life itself”) on the questions we find ourselves vexed over. Tipped via WQXR, beautiful photos of empty opera houses by David Leventi, but brightly lit and expectant–a few moments before the house doors open and the audience floods in? I’ve been to only a few of these (winking to Andrea, who has probably been to every single one, lucky dog). The most memorable was Paris’ Garnier, where I went on an extensive tour specifically for people who worked in opera. It is an extraordinary building. If opera is the 19th century in music, then the Palais Garnier is the 19th century in stone. 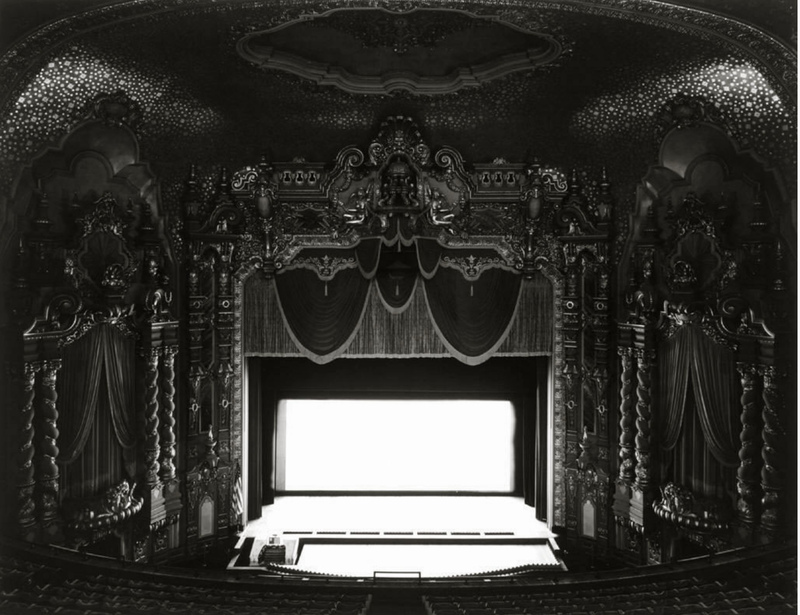 The photos also evoke those haunting pictures of movie house screens by Hiroshi Sugimoto. Those have the added mystery that comes from his having left the shutter open for the entire film, resulting in a blank screen. Since these empty spaces might seem a bit gloomy, here’s a famous picture of the old Metropolitan Opera House (39th and Broadway) filled to rafters for the final gala performance in 1966, before it moved uptown to its present site. The exciting “new” singer at the gala was Renata Tebaldi, but the singer people went crazy for was Zinka Milanov, who owned the old Met in Verdi. (I have this on good authority, namely my opera-loving uncle, who was there.) She connected to a style of singing that went back to the golden age (or ages), heard in many of the houses above once.